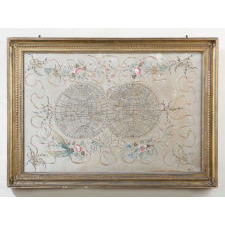 Silk Needlework Map of the Eastern and Western Hemispheres; Reference: A similar needlework is in Clare Browne and Jennifer Wearden, Samplers from the Victoria and Albert Museum, plate 60, page 86. 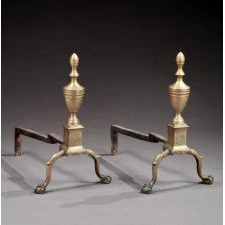 Pair of Federal Engraved Brass Andirons; Each of urn form with claw and ball feet. 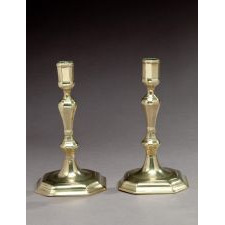 Pair of Brass Candlesticks; With cut corner octagonal bases. 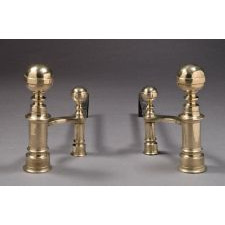 Pair of Brass Ball Top Andirons; Made and stamped by William Hunneman. Provenance: William H. Jackson Co., New York; Williams Collection, Cleveland, Ohio. 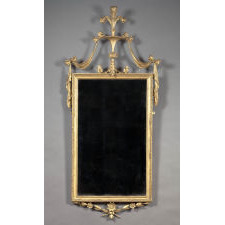 Reference: A similar pair of andirons a..
Set of Six Federal Chairs; With square backs and French feet. Primary Wood: Mahogany Secondary Wood: Ash Reference: A side chair with the same splat is illustrated in Wallace Nutting, Furn..
Rare Queen Anne Figured Walnut Side Chair; Primary Woods: Figured Walnut, Birch Rear Rail (by microanalysis) Secondary Woods: Oak, Yellow Pine Reference: The unusual but successful feet on this chiar are seen on..
Queen Anne Tripod Table; Made of mahogany with pad feet. 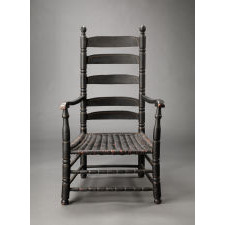 Queen Anne Corner Chair; Made of maple with a pad foot. 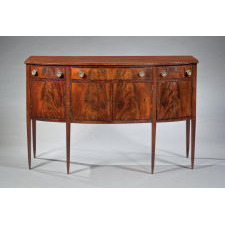 Hepplewhite Bowed Front Sideboard; A small Federal sideboard made of mahogany and mahogany veneers with three drawers above three cabinets. Federal One Drawer Side Table; Primary Woods: Cherry, Mahogany Secondary Woods: White Pine, Birch Reference: For a discussion of the use of geometric inlay in Vermont furniture, please see Jean Burks..
South Staffordshire Enamel Patch Box; Depicting reversible portraits of a man and woman within the inscriptions "Before Marriage" and "After Marriage." 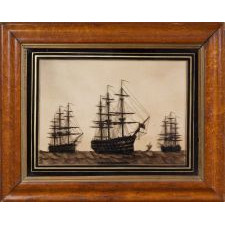 "Nelson's Flagship Victory"; A reverse painting on glass in a bird's eye maple frame. 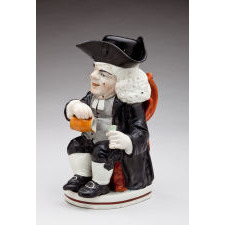 Toby Jug of Dr. Johnson; With cover. 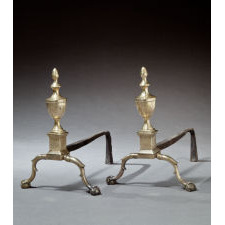 Pair of Federal Andirons; Made of brass with engraved decoration. 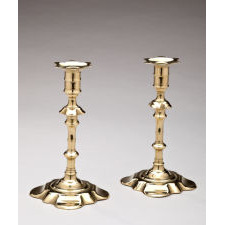 Pair of English Brass Candlesticks; With a petal base. Reference: For an almost identical pair, please see Peter, Nancy and Herbert Schiffer The Brass Book: American, English and European, Fif..
Rare William and Mary Kas; With ball feet and inlaid decoration. Made of gumwood and cherry with poplar as secondary wood. 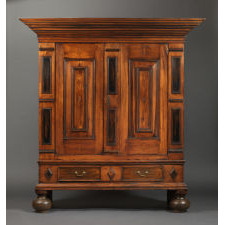 Reference: A similar Bergen County, New Jersey kas appears in American K..
Queen Anne Slant Lid Desk with a "Waterfall" Interior; Made of maple with pine secondary wood. 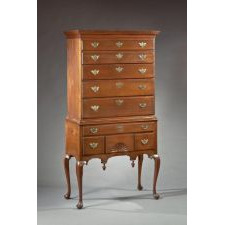 Queen Anne Flat-Top Highboy; Made of cherry with white pine, yellow pine, oak, and tulip poplar as secondary woods. Reference: An article by Edward Cooke entitled "Craftsmen-client Relations in the..
Hepplewhite Inlaid Tall Case Clock; Mahogany case attributed to John and Thomas Seymour. 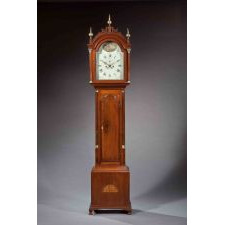 Reference: The construction details on a John and Thomas Seymour tall case clock discussed and illustrated as entry..
Federal Wing Chair; Made of mahogany with bellflower inlay. 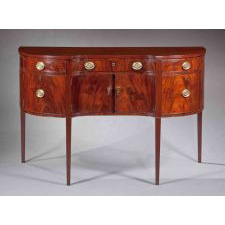 Federal Sideboard; Small mahogany sideboard with a shaped front. Diminuitive Chest of Drawers; A small carved cherry chest of drawers. 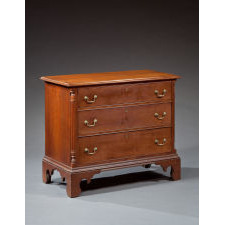 Connecticut Chippendale Chest on Chest; Made of cherry with a carved fan drawer. Banjo Clock with Works by Aaron Willard, Jr.; Made of mahogany, gilt pine, and brass. Provenance: Phillip and Ann Holzer Collection, New York. 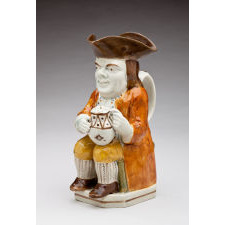 Reference: The clock appears in The Philip and Ann Ho..
Prattware Toby Jug; With the so-called "long face". 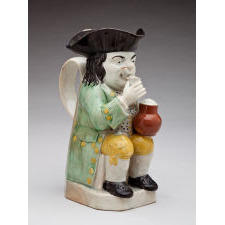 Prattware Toby Jug; Wearing a spotted vest and holding a pipe, glass, and pitcher. Pair of Queen Anne Candlesticks; Each with a swirled base with hatched knopped standard and molded cylindrical nozzle. 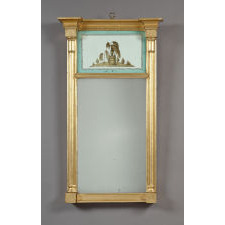 Federal Mirror With Hamilton Memorial; A Federal giltwood and eglomise pier mirror memorializing Alexander Hamilton's burial monument over the rectangular mirror plate. 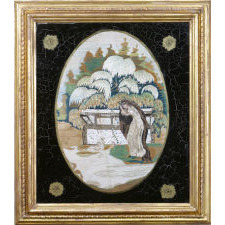 Needlework Mourning Picture; A rare and beautiful Dorchester, Massachusetts silk on silk needlework attributed to a student from the Saunders and Beach Academy. 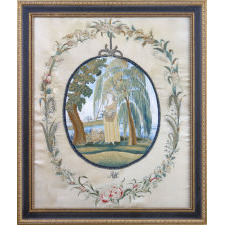 Executed in polychrome silk threads and dep.. 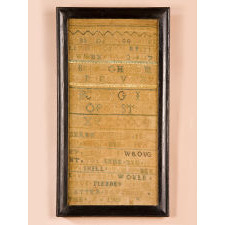 Early Boston Sampler by Sarah Thwing; An early sampler wrought by Sarah Thwing (1737-1753), daughter of John and Joanna Davis Thwing. 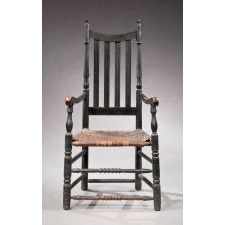 Decorated with the alphabet, numbers, and the following rhyme: "Sarah Thwing is..
William and Mary Slat-Back Armchair; An early painted armchair made of oak, ash, and cherry with five arching slats and ring-turned posts terminating in reel and ball-top finials. The ovoid arms extend with half ..
Tambour Base Work Table; Attributed to Duncan Phyfe or an equally competent workshop. 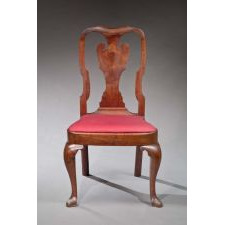 Made of mahogany with four turned feet below four reeded legs emanating from an urn turned standard, all belo.. 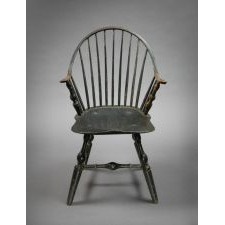 Continuous Arm Windsor Chair; Made of hickory and pine, this painted Windsor chair is branded and initialed H. W.
Hepplewhite Giltwood Looking Glass; A delicate mirror with much of its gilding intact.